Andean horses were developed in the harsh environment of the Andes Mountains (above 9,000 feet) and display characteristics reminiscent of Tibetan horses. The great altitude has created an animal with amazing lung capacity and a thick, dense coat of fur. They are considered the Peruvian national horse. Andean horses, with their strength, great stamina, and well-developed sense of balance and agility, are capable of climbing up mountains at medium speeds with ease. 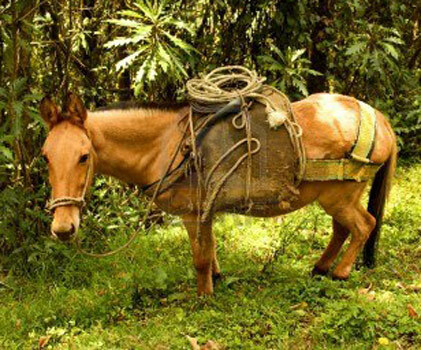 In fact, they can carry a 200-pound pack up steep slopes to 16,000 feet above sea level without becoming overly tired. They are smaller than most full-size horse breeds: they are about 12 to 13.2 hands tall (48-53 inches, 122-135 centimeters). Typical of small horses, the Andean has short and straight pasterns with compact and tough hooves. Their profile is slightly convex with a short neck, heavy-looking head, and broad forehead. Additionally, its ears are also short and small, which is probably due to the Andalusian influence. Typically they are chestnut colored. When compared with its South American Criollo cousins, the Andean looks rather angular, accentuated by its broad, muscular back, rounded rump, and low-set tail. Nevertheless, its gait is typical of horses in the region.